The other night, after the boys were asleep and the Mister and I were settling in to watch Lost (we’re only on season 2, so NO SPOILERS PLEASE! kthxbai), I was pondering which of all my current works in progress I was going to work on. What’s a knitter to do when none of them sounds appealing? Cast on something new, of course! This project has been doomed, DOOMED I SAY!, from the start. Even before I’d cast on a single stitch, I’d turned my ball of yarn into a completely tangled mess. Then, as I’ve tried to learn this new (to me) technique, I’ve had to frog the entire thing, not once, not twice, but THREE times so far. The only reason I’ve persevered is because solving puzzles is fun. Hah. Thank goodness for this tutorial from Knitted Kitty. 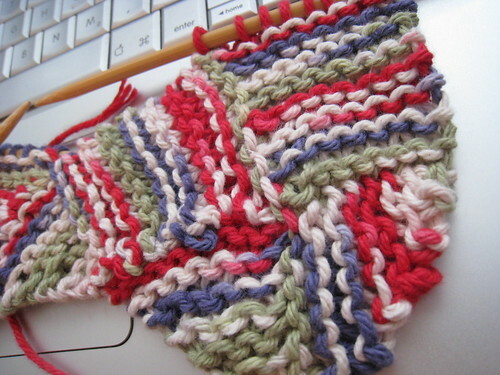 Has anyone else tried the Garterlac Dishcloth (or any other type of entrelac)? What did you think? Previous Post I got my hair did! Next Post the garterlac puzzle: solved. My first entrelac was the Lady Eleanor shawl ( http://livnletlrn.blogspot.com/2007/11/lady-eleanors-in-rehab.html ), made as a gift for my mom. It was one of those things I needed to not try to understand before knitting it, just follow the instructions until it became clear. From there, it was compelling knitting: just one more block! I worked up an entrelac shawl, which taught me the technique, and used up some yarn, and produce a nice fo that the grandbebe girl loved to wrap up in. But for me, it was one of the those techniques that is sort of meh. Other things are so much more intriguing to do. I haven’t done any entrelac yet. I’m a chicken.